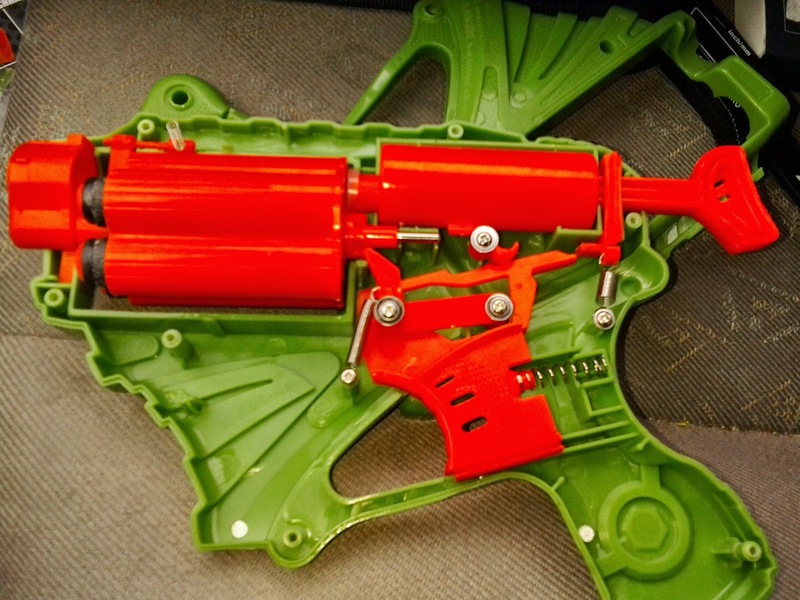 This $9.99 pistol is a smaller cousin to Prime Time's ToysRUs offering, the Air Zone Renegade. Both are direct plunger blasters with a revolver-type mechanism for rotating the cylinder at the very end of the trigger pull. They also both have highly unnecessary empty space under their cylinders, but that's a personal gripe. When you remove all of the screws, here's what you find. The five dart cylinder has no air restriction mechanism, nor any kind of dart post, which means stefans can be used right away if you so desire. The plunger has a 3.8 cm draw, and moves within a 2.0 cm diameter plunger tube. That's roughly 12 ml of volume, or about 0.73 cubic inches. 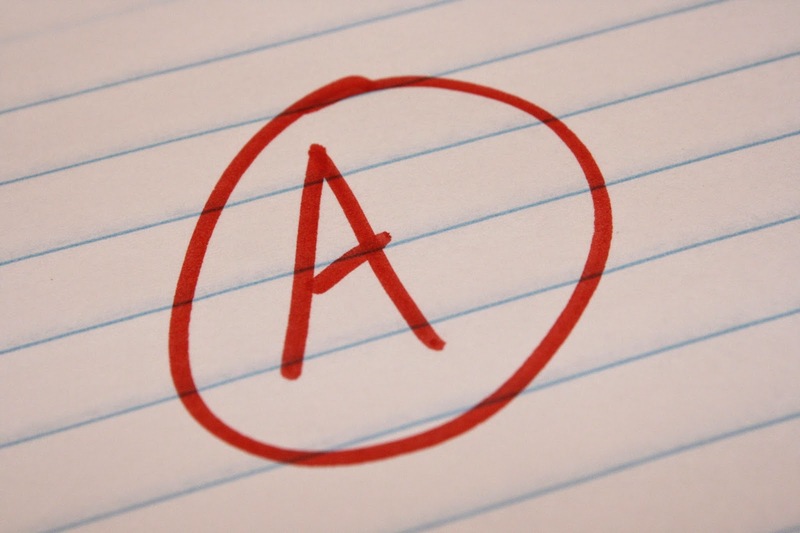 It doesn't seem like much, but the strong spring and absence of any kind of AR make up for it. Here you can see the trigger and revolver mechanism. 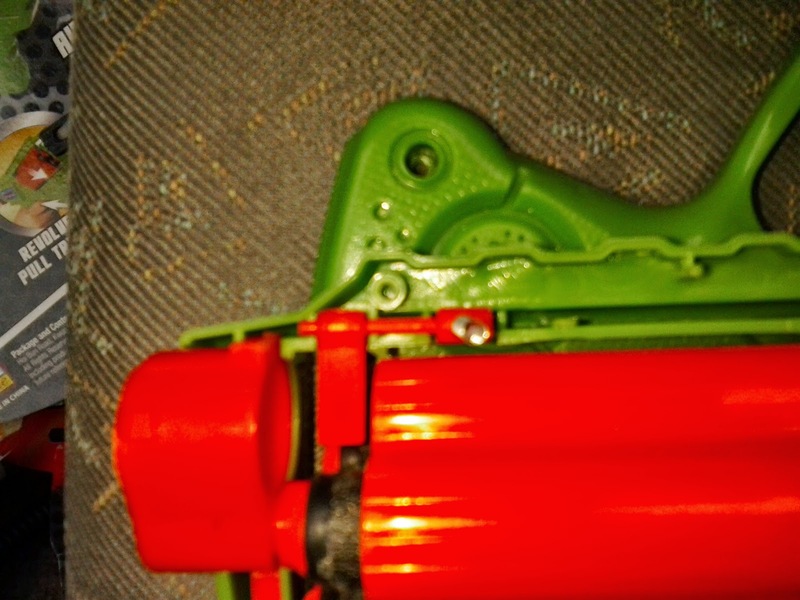 Pulling the trigger moves a long, thin piece of plastic back, which both lifts the catch and (under the uppermost screw) pushes the plunger tube forward so as to seal against the cylinder. 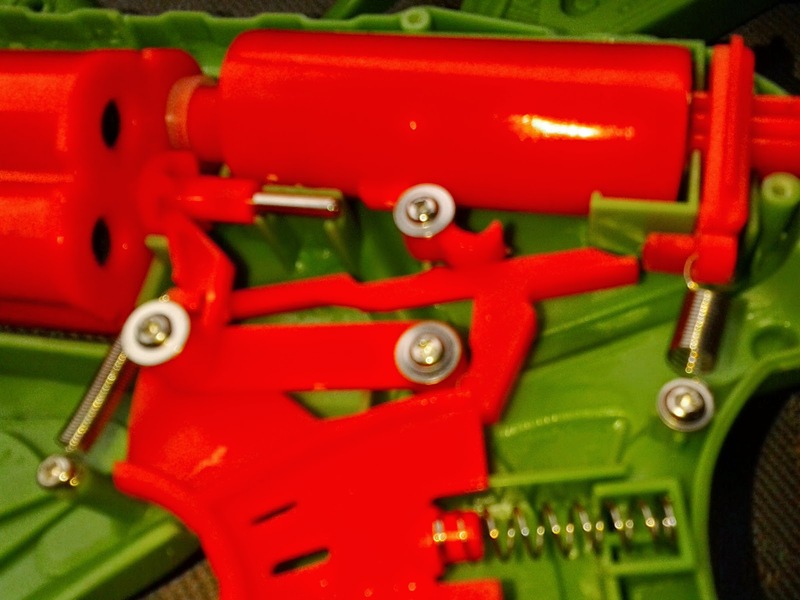 At the very end of the trigger pull, the large plastic pusher in the front presses against a gear tooth until the next barrel is in place. Releasing the trigger returns the pusher to its default position. As with the Renegade, a spring loaded lever sits in front of the cylinder. This provides extra resistance when a dart is pressed against it, preventing the cylinder from skipping loaded barrels. Performance, you ask? After firing the included Super Darts about fifty times, the angled range did in fact average out to 70', with most darts falling within 5' of that mark. 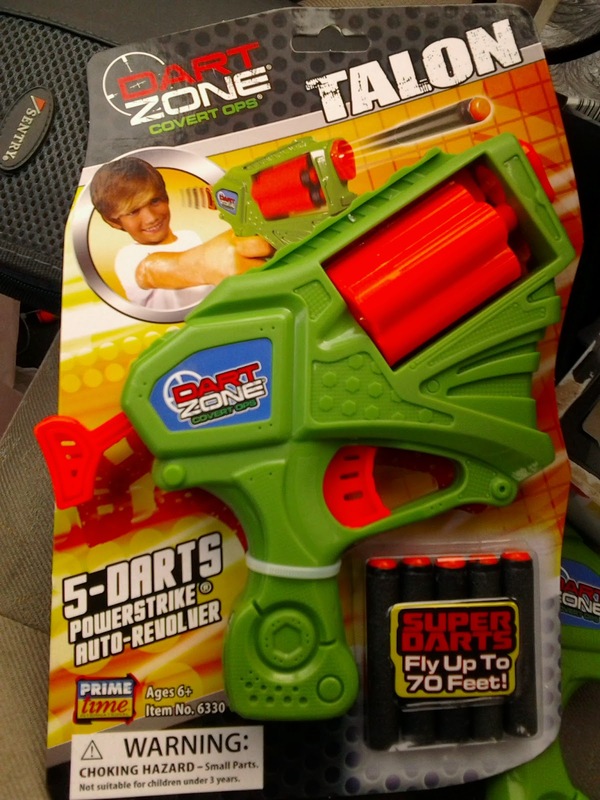 Sadly, since the Super Darts are shorter than Nerf Elite streamlines, the Nerf darts will not fit without some modification to the front of the shell. 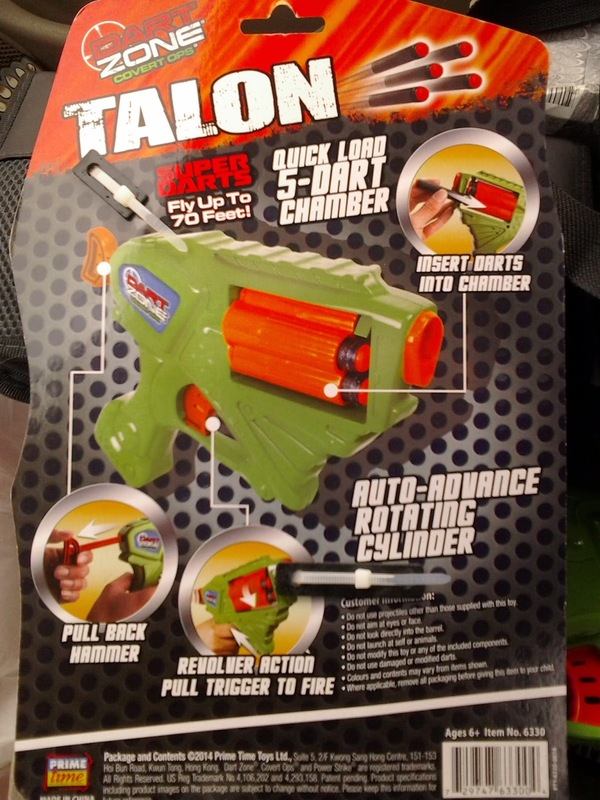 Overall, the Talon is a good $10 blaster for those interested in looking beyond the Nerf brand. A couple dollars more can get you the Air Zone Renegade, with its eight-dart cylinder and higher performance potential. The lack of dart posts, however, does allow the use of stefan darts right off the card, making the Talon a convenient backup blaster for most NIC wars. why are they convinced to make all their blasters look retarted?